There are good reasons to suspect that the bull market in US equities has been stretched to the limit. These include inter alia: high fundamental valuation levels, as e.g. illustrated by the Shiller P/E ratio (a.k.a. “CAPE”/ cyclically adjusted P/E); rising interest rates; and the maturity of the advance. 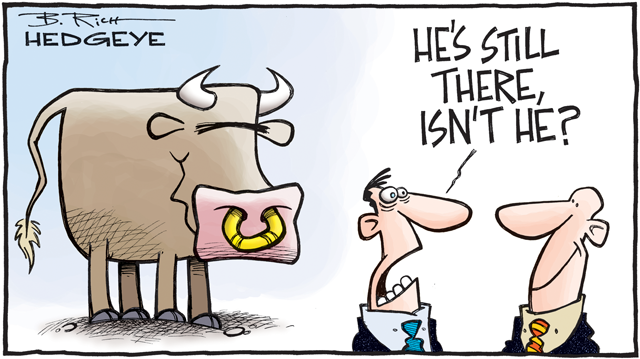 Near the end of a bull market cycle there is always the question of when a decline will begin, and above all, how large will it be. I believe it possible that the retreat in prices will begin soon and that it could possibly even start out with a crash. I will explain in the following what led me to draw this conclusion. Let us first look at a chart of the S&P 500 Index over the past three years including the major trend line formed by its rally. Prices moved up steadily along this trend line for a long time, until the advance suddenly began to steepen significantly in January of 2018. Thereafter prices plunged very rapidly in early February, followed by a swift rebound. This rebound appears to have ended earlier last week. S&P from 2015 to 2018 with trend line providing support: for now the trend line still holds. Let us now compare the developments of recent years to a chart showing the move in the DJIA from 1986 to 1987 (focus on the general shape of the move rather than details such as percentage gains and duration). The similarities between the patterns are quite stunning. DJIA with trend line, 1986 – 1987. After breaking through the trend line, the index quickly plummeted. 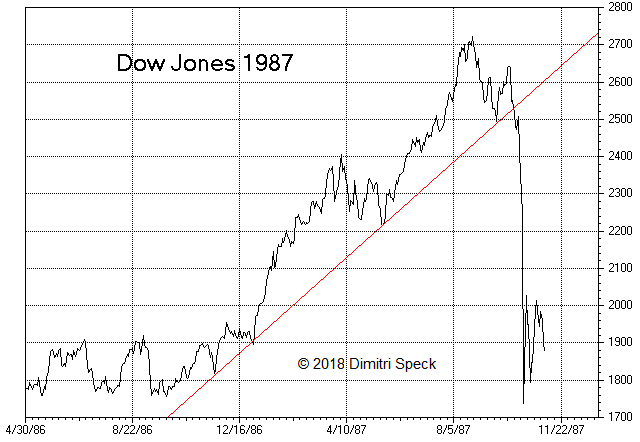 In 1986/87 prices also moved up along a rising trend line; there was a similar acceleration of the rally into the peak, followed by an initial test of the trend line and a rebound. After a short while the trend line was tested a second time. 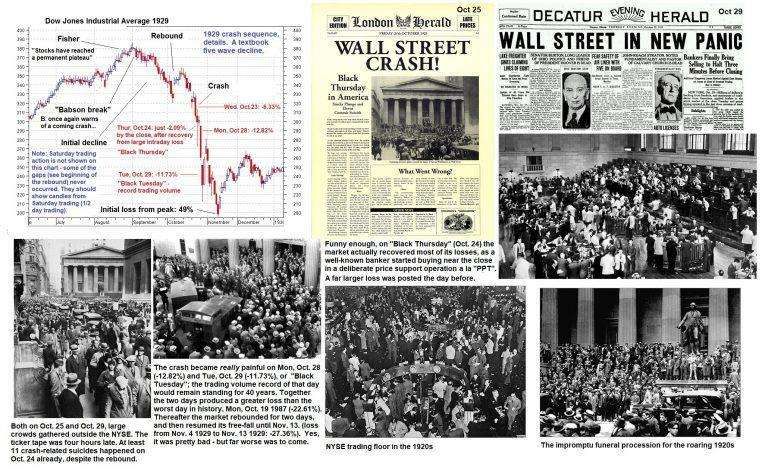 When it failed to hold, the crash commenced, soon culminating in a loss of almost 23% in a single trading day on October 19 1987. Let us ponder a chart of the DJIA from 1928 to 1929 as our next example, once again with the major trend line that supported the advance. Once again there are strong similarities to both the current situation and the pattern observed in 1987. 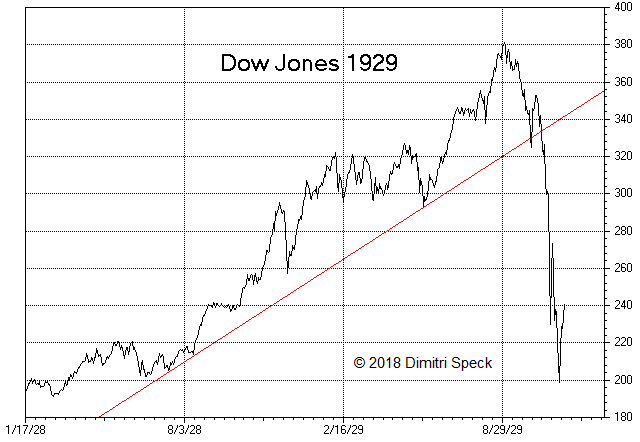 DJIA with support trend line, 1928 – 1929; once again the market crashed right after it tested the trend line that defined the uptrend for a second time and broke through it. Just as happened both in 1987 and very recently, the market rose along the trend line until the rally suddenly accelerated and peaked; this was followed by sharp pullback and a first test of the trend line, a rebound, and eventually a second test that failed and immediately morphed into a crash. A particularly dire bear market ensued in this case – by the summer of 1932, the market had lost almost 90 percent from the early September 1929 top (peak on Sept. 03 1929: 381.17 points; low on July 08 1932: 41.22 points). 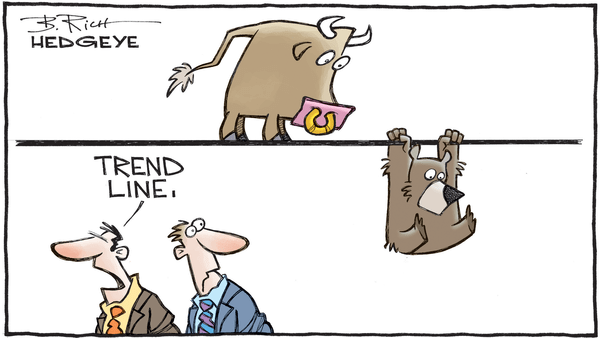 What about non-US equity markets? One of the biggest bear markets of all time has been underway in Japan since 1990. 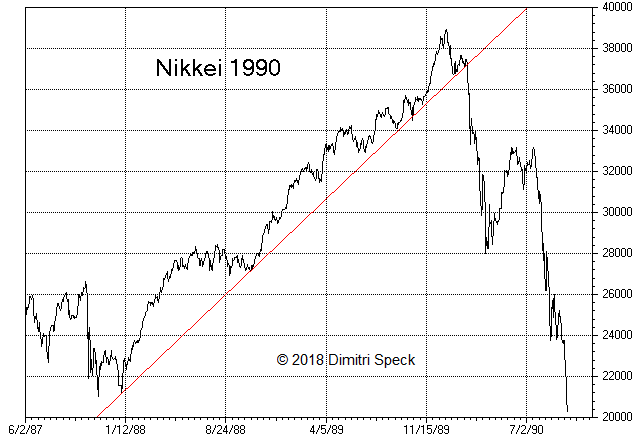 The next chart shows the Nikkei 225 Index, also including the trend line that served as support in the final years of its bull market advance. Nikkei 225 with major support trend line, 1987 – 1990; prices decline strongly after the trend line is broken. Once again prices rose along a well-defined trend line, and once again the rally accelerated into the peak, after which an initial test of the trend line and a rebound followed. On the second test the Nikkei broke through the trend line and a lengthy and severe bear market began. The decline eventually reached a staggering 82% (the low was made in 2009, almost twenty years after the top). When is the Crash Danger Acute? In summary, there are very strong similarities between the chart formation that is in place right now and the patterns that could be observed at the pre-crash peaks of the DJIA in 1929 and 1987 and the Nikkei in 1990. This raises the question whether there are also similarities in the temporal sequence of these patterns. Below is a table that shows the time periods between the most important turning points of the patterns in calendar days after the peak. The line designated “initial trend line test” shows how many days it took to decline from the top to the first test of the trend line. In 1929 it took 30 calendar days, but recently it took just 13 days (peak on January 26 2018, first test completed on February 08). In short, the length of time elapsing between these two turning points was quite different in these cases. The second line designated “peak of rebound” shows the number of days from the top to the peak of the initial retracement rally. In the three historical examples of the US in 1929 and 1987 and in Japan in 1990, it was reached after 37 to 39 calendar days, i.e., these turning points were actually quite close to each other. Currently this would be equivalent to March 02, March 03, or March 06 (at the moment it appears as though the rebound peak may have occurred on February 26. On Feb 27 the market very briefly traded above the range of Feb. 26, but closed lower). The last line, designated “break of the trend line”, shows how many days elapsed from the peak to the second test, when the trend line was broken and the crash wave began. It is interesting that this happened between 45 to 53 calendar days after the respective bull market peaks of the three historical examples. Once again these events happened quite close to each other; the time interval between the top and the failing retest was almost of the same length. Currently the equivalent time interval would target the time period from March 12 to March 20 for the retest. More important than the precise number of days is the break of the trend line as such though. For instance, in the sharp decline in 1998 no such trend line break occurred, after the benchmark indexes had rallied along similar well-defined uptrend lines for a very long time; the strong advance in prices quickly resumed. Readers may well wonder why such strikingly similar price patterns tend to occur at all. There are probably psychological reasons for these similarities. At first prices rise steadily over a lengthy time period, until euphoria (and the “fear of missing out”) lead to an acceleration of the rally, producing a major peak. Such a phase could be observed in January of 2018, when the ratio of bullish to bearish advisors according to Investors Intelligence reached an all time high. What then happens is the opposite of what most investors expect, as prices suddenly decline sharply; initially the pullback tests the trend line successfully. This is what happened in early February this time. By the time the trend line comes into view, sentiment has pivoted completely and has become very bearish, which promptly triggers a rapid rebound. Investors quickly become optimistic again, which paves the way for the decline to resume. In short, expectations are suddenly disappointed at every turn. The subsequent retest of the trend line is the decisive moment though. If it is broken, there is a significant danger that a crash will ensue. 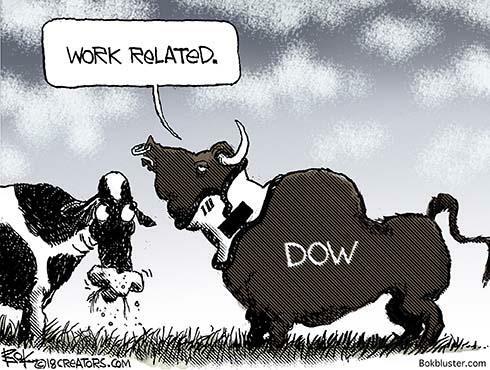 Its psychological function is to thoroughly destroy the faith of investors in perennially rising stock prices. Will a crash happen this time as well? Crashes happen only very rarely after all – depending on one’s definition, one could well say that a real crash happens perhaps once every few decades. However, the factors discussed above suggest that crash probabilities must at the very least be regarded as elevated in coming weeks.